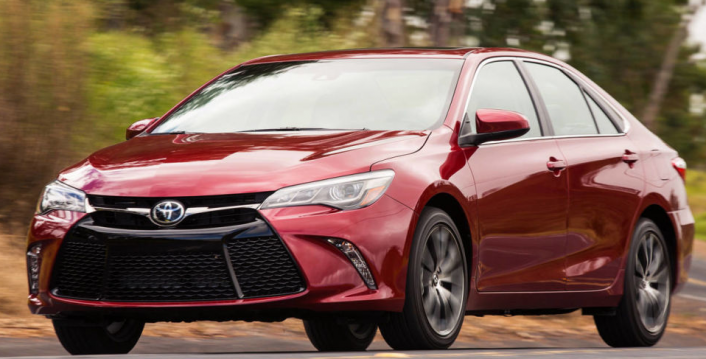 The exterior alone should explain why the 2015 Toyota Camry should be your top choice in four-door five-passenger midsize sedans. The bold and striking profile not only turns heads but allows the car to rush easily through the wind at highway speeds. The mesh front grille is sporty and aggressive while the LED headlights are surrounded by black trim bezels. The Daytime Running Lights keep you visible even under sunlight. Finishing off the style is the dual chrome-tipped exhaust and the standard 18-inch alloy wheel sporting machined-face accents and finish in gloss black. Moving into the interior, the first things you’ll appreciate are the sporty front seats with side bolsters that envelope you in available leather trim with Ultrasuede® inserts. Add contrasting red stitching to surprise your passengers. The center stack in the middle of the dash is your primary control panel. Through it, you can easily adjust navigation and multimedia systems. The stack also lets you adjust the dual-zone automatic climate control so you and your front passenger can stay comfortable. Your hands can always stay on the wheel when you manually shift the standard six-speed automatic transmission through race-inspired paddle shifters mounted on the steering wheel. To please rear passengers, sculpted cutaways in the front seat backs allow for more leg and knee room. The available power tilt/slide moonroof increases ventilation and the feeling of space. The 2015 Camry impresses with a 2.5-liter liter four-cylinder V6 with 16 valves and a double overhead cam. It delivers 178 horsepower and 170 lb.-ft. of torque. The EPA-estimated mileage reaches 35 MPG on the highway, 25 MPG in the city and 28 MPG combined. (A hybrid version is also available with up to 200 horsepower.) The car is considered an Ultra Low Emission Vehicle II because it helps preserve the environment. Power steering eases handling and the power-assisted ventilated front disc brakes and solid rear disc brakes ensures solid stops. The Insurance Institute for Highway Safety ranked the vehicle as a Top Safety Pick because it garnered the highest rating of Good in all crashworthiness tests. The National Highway Transportation Safety Administration granted the car an overall rating of five out of five stars. Its performance in side crash testing was particularly noteworthy. Propelling these top scores are ten airbags, including the Advanced Airbag System for the driver and font passenger, seat-mounted side airbags and knee airbags for the front, rear seat-mounted side airbags, and side curtain airbags for the front a rear. The Whilplash-Injury-Lessening driver and front passenger seats minimize injury under certain rear-end collisions. The Star Safety System™ improves handling with Enhanced Vehicle Stability Control (VSC), Traction Control (TRAC), 4-wheel Anti-lock Brake System (ABS), Electronic Brake-force Distribution (EBD), Brake Assist (BA) and Smart Stop Technology® (SST). Protecting the kids is LATCH (Lower Anchors and Tethers for Children), which includes lower anchors on the outboard rear seat for securing your child safety seats. Power window lockout control and child-protector rear door locks keep the little ones in their places.